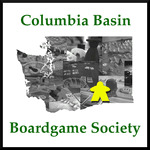 On November 15, 2013, a mere six days after the last Game Night, fifteen gamers once again ignored all warnings and invaded the Official CBBS Gaming Basement, forcing Tim to write yet another Session Report in the two days before he left for BGG.con. 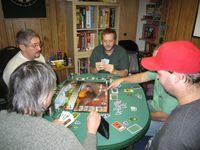 Fortunately, Tim is used to selfless, heroic efforts in service of the gaming hobby. Truly, we are blessed to play in his presence. Andy, Scott, New Eric, Tim, Jerry, Mary, Darin, Birgit, Shawn, New New Eric, Caleb, Tycho, Eden, Eryn, and Kory braved the Eastern Washington gales of November to attend. 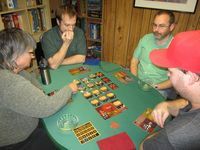 Gamers come from far and wide just to play Ricochet Robots as straggle-inner during one of our famous Game Nights. That is our story, and we're sticking to it. Andy, Scott, New Eric, Tim, Jerry, Mary, Darin, and Birgit each solved at least one, and in most cases more than one, puzzle. Huzzah! 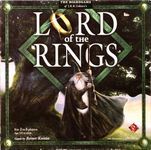 Andy would embark on a night-long campaign to play as many Lord of the Rings games as he could, for no reason. There's coops and deck building and dice building and whatever The Hobbit is - but I'm getting ahead of myself. 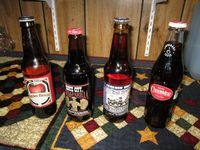 Scott, New Eric, Darin, and Mary were successfully conned into supporting Andy's mad dream. New Eric scored 33 barrels of pipe-weed, while Scott and Andy each ate 24 second breakfasts. 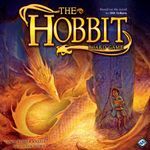 Darin climbed into 19 hobbit-holes, while Mary found 16 hairs on her feet. But! None of that mattered, because Smaug burned Laketown to a cinder and everybody died. The end. Hooray! 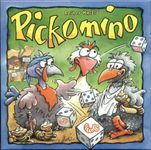 Meanwhile, in honor of the approaching BGG.con, Tim selected Il Vecchio, one of his and Andy's finds from last years con, to run on Table One. Jerry, Shawn, and Birgit were the other Vecchios. Vecchii. Whatever. Anyway, Jerry, as he has done in the, past, focused on building in Florence and hording Council tiles. Unfortunately, there comes a point of diminishing returns, as (for example) a bunch of tiles that give you money are only valuable as long as you need money - so once one hits, the others lose value. Still, he was able to get most of the Medici tiles, and eventually made his way to all five scoring tracks, although in later positions for some of them. Meanwhile, Tim was focusing on the provinces, getting some early (and therefore both cheap and more valuable) placements. Shawn spent most of the game building in the southern (and most valuable) province, while Birgit ended up getting the most Nobility tiles as well as good placement in the provinces. Birgit was able to grab the final Medici tile one turn before Tim was ready to make his move (to get another nobility tile and grab the majority on that Track); her final turn gave her that majority and an extra Nobility tile, while Jerry and Tim had to punt for the two extra points. When the smoke cleared, Birgit's 47 points was enough for the victory. Jerry finished with 44 while Tim scored 42. Shawn ended the game with 34. Caleb and New New Eric had arrived, and while waiting for Andy's little hobbit game to finish they broke out TZAAR, game six in the GIPF project pentalogy. The scoresheet notes that neither had played before, but the rules were easily deciphered. New New Eric won both games, the first by one move while in check by killing all of Caleb's Tzaarans. In the second game he killed off Caleb's Totts. So, basically, you win by killing things. Hooray! Having let Smaug destroy the world, Table Two was ready to give Sauron his chance with Lord of the Rings. This time the hobbits were Eric (as Fatty), Andy (as Frodo), Darin (Sam), Mary (Pippin), and Shawn (Merry). Surprisingly, the Fellowship prevailed, earning 79 points, an adequate/measely/incredible total maybe! 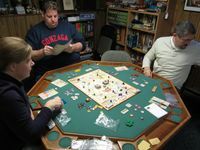 We had to play six on Table One, so instead of something like Alhambra Tim broke out new acquisition La Boca and made Newest Eric, Birgit, Jerry, Caleb, and Scott play. Zoinks! 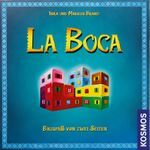 In La Boca, you randomly partner with one other player to try and place the blocks on the display correctly so that each of you can see the profile given on your side of the target card. You both score according to how long it takes you - 10 points for fifteen seconds, nine for 20 seconds, down to zero after two minutes. 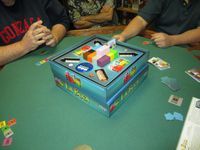 You will play twice with each other player, so with six there are a total of thirty puzzles solved, which will take under an hour to do. We played with the "easier" light blue cards, which don't involve the large and awkward red piece. By the end we had all learned how to deal with the long yellow and L-shaped blue pieces; the absence of the red spaces meant that you usually had some room to move pieces forward and back, and we got progressively better as we went along. The next time we play we'll use the dark blue cards, which should be much more unforgiving. There is also the fact that you will have to make change several times in the game, to put your 2 and 5 chips back into circulation. There is a lot of opportunity to accidentally grift yourself or your opponents in a situation like that, and I wish a better method of recording your score was included. Anyway, Scott finished the game with 81 points for the win. Birgit and Jerry each got 77, while Tim finished with 71. Newest Eric and Caleb were the only ones to zero out a round, going over two minutes when they couldn't get the blue piece right; they ended the game with 70 and 63 points, respectively. By this point, Tycho and Eden had arrived - but, alas, there were no openings in the Inn. 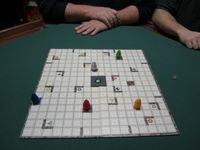 So they were exiled to the manger of Table Three, to play Würfel Bohnanza. Tycho barely edged Eden, 13 points to 12. Zounds! End time: Rollin', rollin', rollin'/Though the streams are swollen/Keep them dogies rollin'/Rawhide! 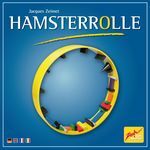 Next up was a two player game of Hamsterrolle on Table Three, with (again) Eden and Tycho playing. Eden got all her pieces on the Wheel of Doom while Tycho still had two left. Hooray! Because Table Two was still killing orcs or some damn thing, we needed a seven player bridge game to take us to the reconfig. We briefly considered Liar's Dice, just to annoy the Gandalf cosplayers next door with all that dice rattlin', but instead broke out Pickomino. 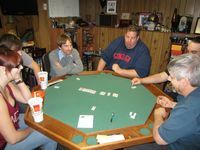 The players were Caleb, Eden, Tycho, New New Eric, Jerry, Tim, and Scott. As always in a big game of this, some players had the knack for scoring worm tiles, and some didn't. 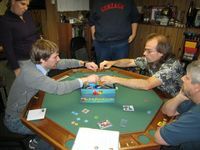 But who is what can actually change midway through the game, as it did for Tim who had a big three worm tile covered by the 22, and then had both of them stolen over the course of half a round. Anyway, the game came down to Eden, Tycho, and New New Eric, all of who had multiple, big worm tiles. Eric had stolen Eden's 25 and then rolled 36 to get the biggest tile left in the game. But Tycho then rolled exactly 34 to steal that tile and finish with 5 worms. New New Eric also had 5 worms, but the 34 tile was tops and Tycho won the tiebreaker. Eden finished with four worms, despite being stolen from multiple times, while Caleb had a two wormer and Jerry and Tim had one worm apiece. Scott actually started the game, but had no luck early and therefore had to keep pushing his luck late. Sadly, it did not pay off, and he ended the game wormless. It might have been time for a reconfig; or, perhaps, everybody was just tired of waiting for Table Two. 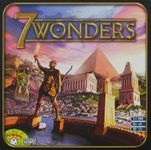 Anyway, we needed a seven person game, which is why we set up and splained 7 Wonders. But! Eryn and Kory finally arrived just as we were about to play, so Caleb bailed on Table One - which meant we had to remove all the 7+ 7 Wonders cards and redo the Guild cards. Harrumph, I say! Harrumph! Anyway, that left, Tim, Scott, Eden, Tycho, Newest Eric, and Jerry to play. 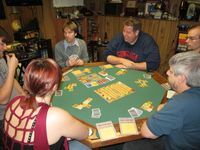 It was actually a very close game, as Jerry focused on Green cards, Tim built resources and then played every Blue card he could find, New New Eric ended up with three big Guild cards, and Scott supplemented his Blue holdings with extra Wonder points, to put all four players within seven points of each other. But Tim had managed to steal four Green cards from Jerry, earning 13 points in the process; that made up for Scott's advantage in Wonder and Guild points to give him 59 for the victory. New New Eric's Guilds gave him 24, and he scored reasonably well in other areas to finish with 57. Scott finished with 56 and Jerry ended up with 52. 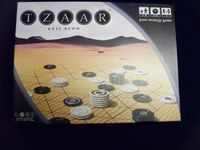 Tycho got some Blues and Purples and won big in the military, but that was only good for 46 points, and first-time player Eden got trapped without the resources she needed to finish her wonder and ended up with 34. The game on Table Three was Eminent Domain, played by Caleb, Eryn, and Kory. The scoresheet says that Eryn only cheated a "little bit" on the way to her 20 point victory. As everyone was colonizing the game went really quickly and it was impossible to implement any long term strategy. Caleb tried to do trading, but he had too many useless production slots, and he finished with 17 points. Kory had 13. 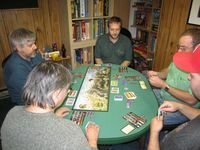 When Table Two was done with their game about Middle Earth, they started a game about Middle Earth. 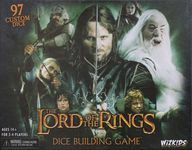 This time, it had the ridiculous name of The Lord of the Rings Dice Building Game, mixing theme and mechanics in a succotash of promotional nonsense. 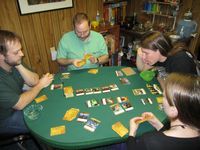 Nevertheless, that is the game they played, and the players were Andy, Darin, Mary, and New Eric. Andy scored 26 orc heads, while Darin earned 24 warg pelts. New Eric accrued 14 + 8 petrified trolls, and Mary finished with 13 + 8 piles of oliphant dung. And, apparently, the Ring was destroyed!!1!11!!! Yay. To slay another few minutes while Table Two punched more dwarves and elves or whatever, Table One played three ridiculous hands of We Didn't Playtest This At All. 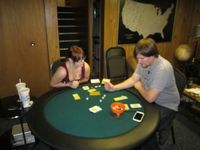 The primary advantage of this game is that it takes very little time to either splain or play, as long as people don't waste time reading and thinking about their cards or anything. 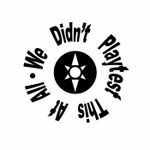 Tim, Scott, Tycho, Eden, New New Eric, and Jerry were the playtesters. In Rounds One and Three, everybody lost! As per usual, we dumped a lot of players (even before they had a turn) playing Rock Paper Scissors, and then in Round One a Vote went awry and in Round Three everybody left threw Rock when the most common outcome lost. In Round Two New New Eric played the "You Win" if the number of players left is even - since it was his first turn and nobody had lost yet, he won. Hooray! 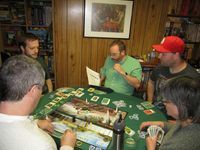 In the somewhat vain hope that Table Two would be ready to reconfig soon, Tim, Scott, Tycho, Eden, New New Eric, and Jerry played a quick round of Finito!. Scott and Eric won. Yay. For the reconfig, Jerry was itching to play Alhambra again after his glorious victory at Andy's house a couple weeks ago, so he wrangled Eden, Tycho, Scott, New New Eric, and Caleb into joining him on Table One. This actually went pretty quickly for a six player game. Caleb was the clear winner with 92 (or maybe 93) points, while Eden scored 67, Eric earned 61, Jerry gathered 58, Scott finished with 57, and Tycho accumulated 55. For a change, Table Two was host to a Middle Earth game. This one was about deck building or Rohan or whatever. Andy was Merry and Pippin, Kory was Sam, Eryn was Frodo, Tim was Gimli, and New Eric played Aragorn. The Hobbits, weirdly, did most of the fighting, as Eryn and Andy got most of the Archenemies and Kory had some really big turns. In the end Eryn was able to capture 31 points while Andy made due with 28. Gimli, meanwhile, was so despondent after the first Ambush gave him three extra Despair cards, that he just hung back in Helm's Deep and smoked his Longbottom Leaf. Sure, he axed a couple Dunderlings, whatever they are, and the occasional Uruk-hai cannon fodder, but he never came close to being able to capture any of the really big cards, much less an Archenemy. 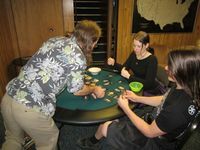 Surprisingly, though, toking out is actually an effective strategy in this game, as three Longbottom Leaf cards gives 9 points - added to his bunch of one pointers, Tim came in third with 25 points. Just one more Leaf card would have put Tim in contention, which is a little thematically troublesome. 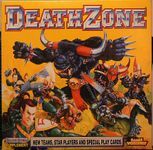 I don't know why Kory only scored 24 points - he had a bunch of land and some really big turns, regularly scoring double digit Powers. He must have had a pantload of Corruption cards - for shame, Samwise Gamgee. Lord Aragorn had the same trouble as Gimli - he could never put together a big turn when a key card came out, and couldn't even take advantage of the two Fortune cards he drew. In the end, he only had 18 points. 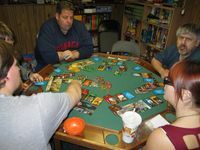 Andy claims that we actually all lost, as we went through the "good card" deck (whatever that is called in this game). But it is unclear whether that means Helm's Deep actually fell or not - after all, we never even got to a Breach on the wall. Table One was done before Table Two finally destroyed Middle Earth or whatever, so they needed a bridge game. For this purpose, Scott, Tycho, and Jerry selected Würfel Bohnanza, for no reason. Jerry won! Scott lost. Tycho lost. 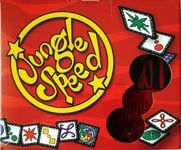 As is our wont, once we joined together in one big table to sing kumbaya and braid each others' hair, we also played a feisty and dangerous game of Jungle Speed. Tycho won the first two games, New Eric won the third game, and Andy won game 4 - despite being between a right-flipper and a left-flipper, and thus being at a huge disadvantage. We had five players left for one final game, so Andy, Jerry, Eric, Scott, and Tim cast about a bit for a suitable ender, when suddenly we discovered Last Call: The Bartender Game, a game that was almost literally made for just this situation. Tim quickly got three of his drinks down with one ice cube each, but had his five bottle cocktail left, and Andy kept screwing up Tim's target bartender, Otto, by putting too many black bottles there. This gave Andy enough time to try a tricky gambit - taking three ice cubes to get to 6 total to finish his set, and force Last Call. 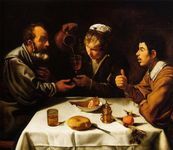 Unfortunately for Andy, Tim was able to finish his final cocktail with just two cubes to finish with 5. Everybody else got to exactly 6, so it was a very close game, but Tim's Tiki Lounge prevailed for the victory. For future reference, it seems likely that most drinks can be completed during Last Call with two cubes - it will only take three if you are unlucky or simply made no progress at all during the round. Yes, those are Pork Rinds. They have no carbs! That makes them healthy. 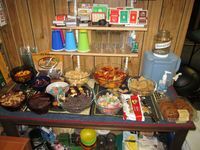 I also, somehow, forgot to get the Doritos, which are traditional Game Night food, going back to my days of playing D&D and Car Wars in my basement with my other loser junior high friends. I think it might not actually technically qualify as a Game Night without some kind of Doritos. I do like those Pumpkin Chocolate Chip cookies. Huckleberries, apples, cheerfulness, and sass.